This summer you might have glimpsed shape-shifting producer and performer The Swedish Housewife singing with The Fastbacks, hosting A Mid-Century Modern Celebration at The Triple Door, or demonstrating how to correctly butcher a chicken while in full Swedish Housewife regalia at Bumbershoot (dutifully pitching in for the launch of Kurt B. Reighley’s book United States of Americana: Backyard Chickens, Burlesque Beauties, and Handmade Bitters: A Field Guide to the New American Roots Movement). If such a display demonstrates how far removed from the production process modern end-users are today, Paula- aka The Swedish Housewife- is the antithesis. As a producer, if anyone can open a can of worms and dream up a full-scale, 90 minute production featuring custom sets and a 20+ cast of vanguard dancers, musicians, and burlesquers, it’s The Swedish Housewife. The woman just won’t sit still. 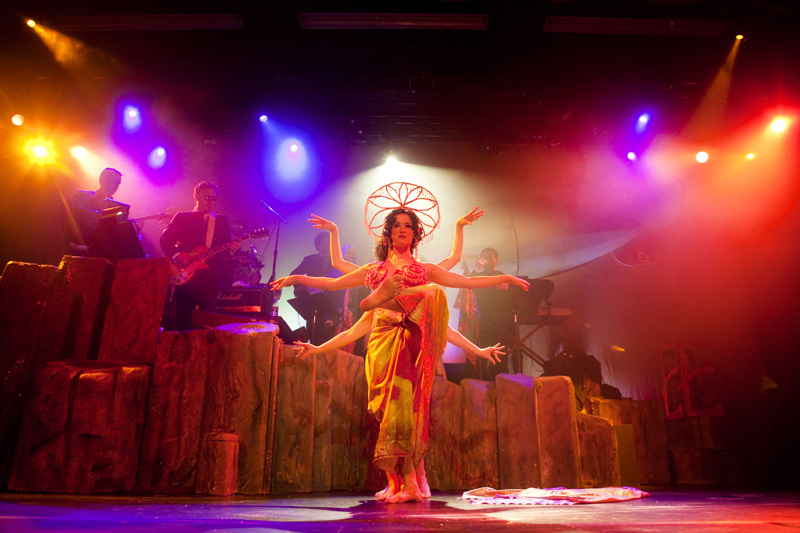 The monstrous ensemble show updates what is perceived as burlesque and levels the playing field between male and female performers, musicians and dancers. Like most of her productions, House feels very grown up- feral women in power positions, men taking off their clothes, sexuality that is sophisticated and doesn’t pander to the cute or the coy. Viking ships, orgies, druids, sirens, zeppelins, and general excess are much more aligned with Paula’s Oz-like scope. There’s so much happening onstage it’s hard to take in; not to mention the sheer volume of dancers in various states of undress. Waxie Moon, Lily Verlaine, Miss Indigo Blue, Inga Ingénue, Lou Henry Hoover, Heidi Von Haught, Polly Wood, Leroi The Girl Boi, Gerard Delacroix, Douglas Ridings, Paris Original, Lydia McLane, and of course, The Swedish Housewife, will burlesque the 70s- sometimes en masse. This year’s run will be the last for a while, as Paula sinks her teeth into another genre rife with button-pushing possibilities, glam rock. More details TBD on the new spring show… for now, get thee to the Triple Door. ~ by angrytruffle on 09/22/2010.